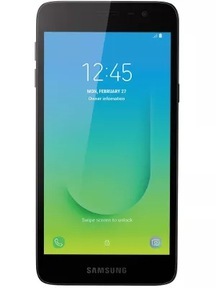 The Samsung Galaxy J2 Core was an introductory-level smartphone launched in August 2018. A successor to the Samsung Galaxy J2 Pro (2018), it featured some exciting changes compared to its predecessors in the Galaxy J2 lineup. In its price segment, the phone truly offered value for money. The Samsung Galaxy J2 Core was praised for its aesthetics. It was designed beautifully with a glossy back panel and felt sturdy in hands. The most exciting feature of the Galaxy J2 Core was its operating system — Android 8.1 Oreo (Go Edition) with a layer of Samsung Experience UX. The phone sported 5.0 inches PLS TFT qHD display with Corning Gorilla Glass protection. It was equipped with an Exynos 7570 quad-core processor alongside 1GB RAM and 8GB internal storage, which could be expanded up to 256GB. The Samsung Galaxy J2 Core shipped with a removable Li-Ion 2600 mAh battery, which was enough to last through a day. Want to sell your used Samsung Galaxy J2 Core to buy a new phone? Cashify can help you with selling your phone, and you don’t even need to worry about price bargain. Why Sell Your Old Samsung Galaxy J2 Core On Cashify? 1. You will need to give input on some simple questions about your phone (age, condition, bill, warranty, etc.). These questions need to be answered correctly for a fair price evaluation by the Cashify’s automated pricing model. 2. Cashify will determine the best price based on the details you provided. From there, Cashify will handle the rest, and you will even need to leave the comfort of your home, as an agent will visit your place to pick up the phone. 3. After arriving at your doorstep, the Cashify agent will evaluate the phone for its authenticity against the provided information. If everything checks out, the agent will instantly pay the price amount in cash, bank transfers or via e-wallets such as PayTM. The Samsung Galaxy J2 Core was an ideal choice as an affordable phone. However, it was built to run on the Android Go OS and was optimised for lite apps, which may not be suitable for many users. Cashify is the most trusted platform in India to sell a mobile phone and other gadgets online for instant cash on pickup. Schedule a pickup now!